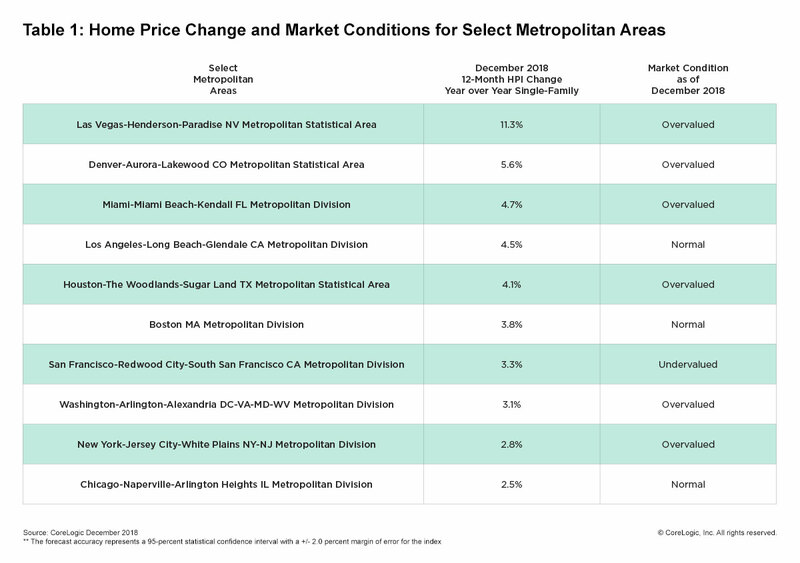 The CoreLogic Home Price Index puts the annual rate of appreciation nationally at 4.7 percent in December and the gain from November 2018 to December at 0.1 percent. 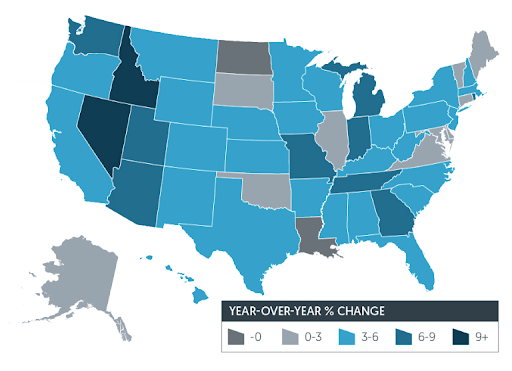 All states but Louisiana and North Dakota had price increases over the 12 months ended in December 2018. The highest rates were in Idaho at 11.7 percent, Nevada at 10.8 percent, and Utah, 8.7 percent. Frank Nothaft, CoreLogic's Chief Economist noted that price increases have been moderating. "Higher mortgage rates slowed home sales and price growth during the second half of 2018. Annual price growth peaked in March and averaged 6.4 percent during the first six months of the year. In the second half of 2018, growth moderated to 5.2 percent. For 2019, we are forecasting an average annual price growth of 3.4 percent." The CoreLogic HPI Forecast is for appreciation of 4.6 percent from December 2018 to December 2019, but a decline of 1.0 percent from December 2018 to January 2019. Comparing the annual average HPI and HPI forecasts for 2018 and 2019, the company says annual price growth will slow from 5.8 to 3.4 percent. The CoreLogic HPI Forecast is a projection of home prices using the CoreLogic HPI and other economic variables. Values are derived from state-level forecasts by weighting indices according to the number of owner-occupied households for each state. CoreLogic is a partner in the S&P CoreLogic Case-Shiller Index and the December HPI report compares Case-Shiller and its own index and their forecasts from 2000 to the present. Both indices are posting positive but moderating year-over-year changes, and forecasting gains for the next year. Last years survey of consumer housing sentiment conducted by CoreLogic and RTi Research assessed attitudes toward homeownership and the driving force behind the decision to buy or rent a home. 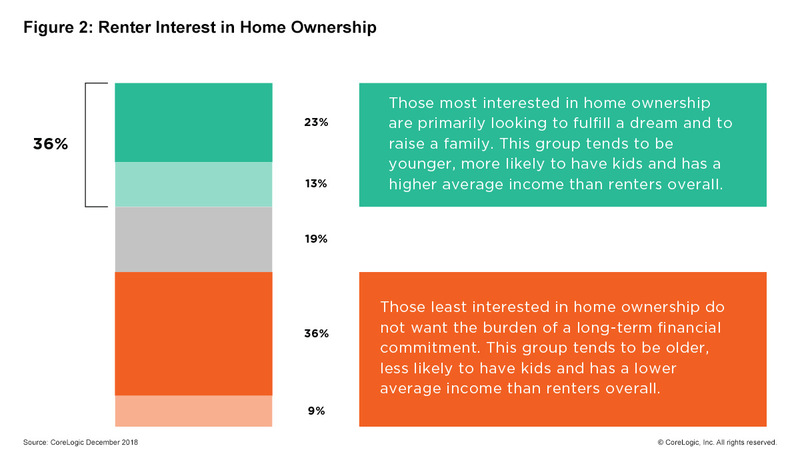 When renters were asked how interested they were in owning a home or residence, 36 percent felt homeownership would allow them to fulfill a dream and provide a place to raise a family, but 45 percent claimed they could not afford to buy or take on the responsibility of ownership at this time. CoreLogic speculates this may change as home prices moderate. The company's CEO Frank Martell said, "The slowdown in the rate of home price appreciation reflects the impact of inventory shortages and growing affordability issues in many markets. On the positive side, if home-price growth continues to moderate, interest rates remain stable and household incomes rise in 2019, it could help renters and first-time buyers to take the plunge and realize the dream of owning a home." CoreLogic regularly analyzes the country's 100 largest metro areas to determine whether they are at value, undervalued, or overvalued by comparing current home prices to their long-term sustainable levels as supported by local market conditions such as disposable income. As of December, they found 33 percent overvalued, with prices at least 10 percent higher than those sustainable levels. Twenty-seven percent were undervalued (down 10 percent or more from benchmark levels) and 40 percent were at value. Among the top 50 markets 40 percent were overvalued, 18 percent were undervalued, and 42 percent were at value.